Even those who acknowledge God and even try to follow Him well also like their own comfort zones, looking to and trusting their own idols of their lives, of culture, of this time or place. Listen to yourself today. What do you focus on even more than God? What do you trust, perhaps more than Him? Who do you immediately run to? What do you prefer to do in your own strength? How do you rely on yourself or others more than Him? Be honest. Until you are, you will not change and grow as God intends. You can care about someone or something without caring for him or her. One is passive; the other is active. That’s not to say that you have to make a grand gesture to show that you care for someone. There are many ways to care, from large to small. Sometimes the smallest things can seem enormous when someone is in need of care. Simply getting a note or text that someone is thinking of you when you struggle reveals a level of care, because that person displays care for you even when you are not standing in front of him or her. You are remembered. Saying we care, that we’re willing to help, or that we’re praying is easy. It’s the follow-through that goes beyond words that takes time and effort. That’s not to say that if we don’t take action at a specific time or in a specific way, we don’t care. We can’t do all things for all people. But we can do some things for some people. We can trust that God weaves our lives together and we work together to care well, even when we can’t see all the care that’s happening around us. We can trust that God cares even when we feel separated from others, ignored, and overlooked. Be active in your caring–both giving and receiving. Invite God to guide. Instead of responding to someone the way you would want to receive care, consider how that person would want or need to receive care and, more importantly, how God is guiding you. Be generous. Care abundantly. Don’t Create Victims. Equip Survivors. It doesn’t have to be a major crisis. It can be the daily wear and tear of life. We want to help. We believe we need to help. We’re certain God directs us to help. But what constitutes true help? It is often different for varying situations and people. What will equip one person demeans or overwhelms another. What boosts and motivates one person causes another to feel entitled to future help. When we help, we need to equip survivors, not create victims. It’s easier said than done. We may want to take control and feel as if we have all the answers. We don’t want to be generous in case someone takes advantage of us, or we want to be generous when we’ll set a precedent we can’t maintain. So, how do we know how to respond? Let God lead, then trust Him with the results. The results we see won’t be perfect. They will be messy, because life and people, including ourselves, are all messy. We may think we’ve failed someone when he or she needed to struggle through the situation in order to grow. We may think we’ve helped when we’ve started a ripple effect that negatively affects many. But God can deal with it all. What we offer must be purely motivated, seeking to honor Him each step of the way. We need to give Him our strengths and weaknesses, humility and motivation, doubts and fears. We can trust Him to help us survive and thrive through the process of helping others despite, and perhaps because of, the difficulties. Just because we can’t say something doesn’t mean we haven’t said what needs to be said and done what needs to be done. We need to live well, love well, and choose well. None of those things are one time actions or responses. We can be overwhelmed by needing to say or hear the right words at the right time, but there is so much more to our lives. There are patterns. We build as we make choices. We build as we interact with each other. We build as we live. Or we can tear down. We don’t have to put a weight of pressure on ourselves but we need to take our choices serious enough that there is intentionality behind them. What we do has an impact. We’re not just biding time here on earth. We impact others–for good or not. Consider friends, family, coworkers, neighrbors, and so on. How will you invest in their lives today? Pay Attention. You Still Might Not Know. I would have never known. I wouldn’t have guessed. It reminded me to be willing to pay attention, listen, and help, because no matter what assumptions I make about the people around me, I never really know unless I interact with them. Neither do you. Resolve to pay attention. Have you ever wanted to go to Israel? More important, why is it stopping you? How is what you have “not enough”? Are you certain it’s not enough? 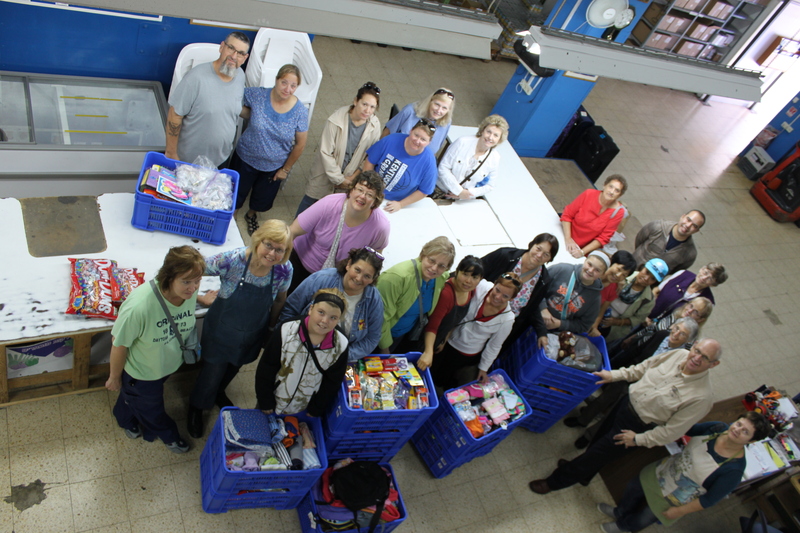 We received a list of items need by Bridges for Peace, where we served in Israel. We gathered as much as we could pack, and we lugged around our extra suitcases for the first several days until we began serving. We combined our bags and packed them on the bus. 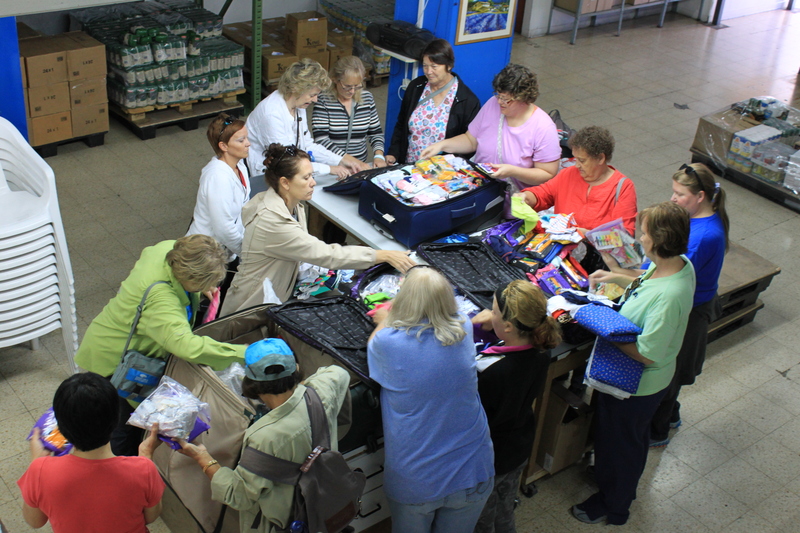 We rolled them into the building where they would sort, store, and distribute the items, and we started unpacking. Little by little, those working and serving at Bridges for Peace that day came to see what all the commotion was about. They found an explosion of suitcases as we filled bins. And they had tears in their eyes. We started with a list, but what we didn’t know was donations were down because of the change in airline baggage fees. We didn’t know they had been out of baby clothes for three months. We didn’t know the baby clothes we had brought were enough for six months. We didn’t know they had been praying for provision and witnessed God’s answer. They cried for joy, hugged and thanked us. We cried, too…partly for joy, and partly because we wish we had known. We wish we had done more. It was pretty easy to gather items, pack them, and roll them on and off our planes and buses. What we thought was “not much” was an abundance for those in need. Yes, we could do more, but what we did was…something. Look around. You are surrounded by needs in your home, church, community, and world. You can’t solve every problem or meet every need, but you can do something. Don’t let “not much” stop you. It might just be more than enough. And don’t let your “not enough” stop you from exploring the possibilities of journeying and serving in Israel. Space is limited, so we can get to know each other well and serve and travel well. Click here for more information. It’s the time to be merry, yet many struggle with pain, depression, anxiety, and family conflict this time of the year. It’s time for worship, yet we let worship of the wrong things crowd out the right ones. It’s time to give, yet in the rush to give, we don’t always give in the best ways. Look around. There is someone in need around you. It might be a need for material things, someone who can’t give gifts to their children and maybe doesn’t even have contact with their family. It might be a need for other essentials, a space heater, warm blanket, or weatherization tools to keep the cold out of their house. Perhaps it’s a need for a house, or at least, a place to stay. Warm socks, gloves, help with medication, shoes, car repairs, and the list goes one. Or perhaps the need is emotional. You can’t fix a situation, but you can listen. You can walk through this season with someone. You can share a smile and cheer an overwhelmed parent or a frustrated customer service worker. Giving isn’t something we do just to check a box on our list of things that are right to do this time of the year. It’s not a part of our Christmas list. It’s really not about this time of the year anyway. It’s about generosity and justice. It’s about keeping our hearts and eyes open to needs. Set aside your plans for the next few days and replace them with a willingness to see and help someone else. Make it a chronic commitment.